This December will be dedicated to offering ideas on the great and not-so-great gifts for infants birth to 12 months! Check back often! We start with my favorite find for our 3rd child, wishing of course we had found it for #s 1 and 2! It’s the Lily Pad playmat by Nook. 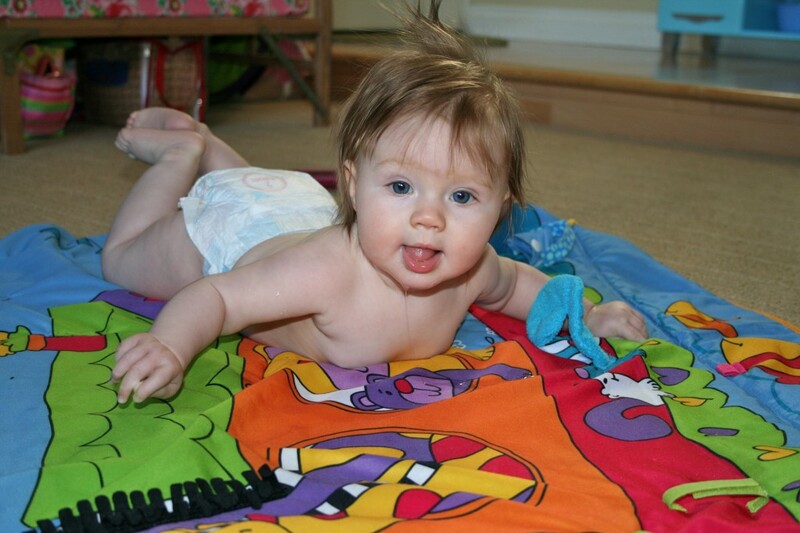 It is portable, washable and is PERFECT for tummy time! The cushion is made of breathable air cells, so there is always good air flow around your baby’s precious nose and mouth no matter what his head position. It is firm enough for baby to push into and work to pick his head up, YET cushy enough to soften the inevitable head bob face plant, even when placed directly on hardwood floor! Enjoy this find and Happy Tummy Time! Just as there are products out there that truly help our babies discover new ways to move, become aware of what their bodies can do, and encourage active development of pathways to increase the body-brain connection, there are also products that do all this hard work for them. Product manufacturers create new items every year that make the hard work of developing seemingly easier and more fun, but often with unintended consequences. We don’t want our babies to be passive participants in the hard work of creating foundations for their own independence. 3) free exploration of movement on all planes of motion: front/back, side to side, and rotation (movement from legs and swing is primarily frontal). All of these essential items are accomplished by simply placing baby down on a play mat surface, holding baby across your chest or lap on their tummy, or carrying them in a tummy down position. So, please consider saving your money with this product and opt for a great playmat where your baby can do her own independent exploration of movement. If you have this product, no need to stop using it, but please have your baby enjoy it in small doses! 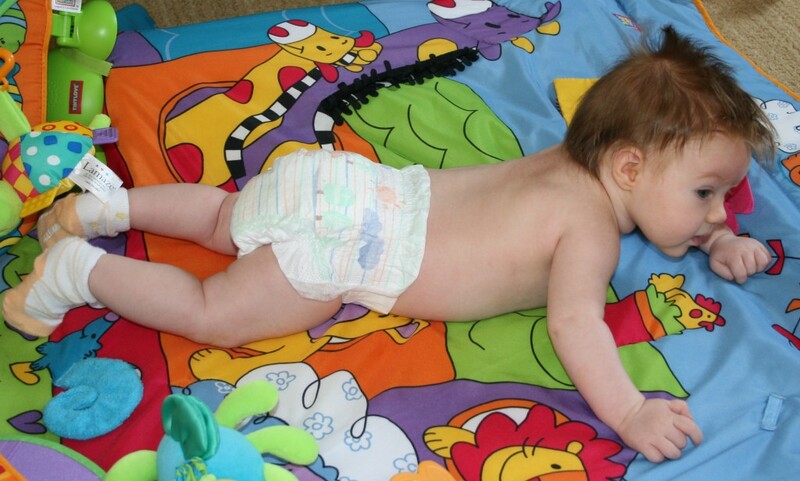 Tummy Time, Part I: Why are we talking about this? The “Back to Sleep” program, introduced by the American Academy of Pediatrics after comprehensive research from multiple continents, was one of the most successful public relations campaigns. From 1994 to 2006, the frequency of babies placed on their backs to sleep increased six-fold while at the same time the SIDS rate was reduced by 50%. However, there have been many unintended consequences. Before the back to sleep program, infants had a combined awake and asleep time on their tummies of at least 18 hours per day. We are lucky these days if infants experience even 30 minutes per day. That is a lot of time lost in a position that is imperative for proper development in many domains and body systems. 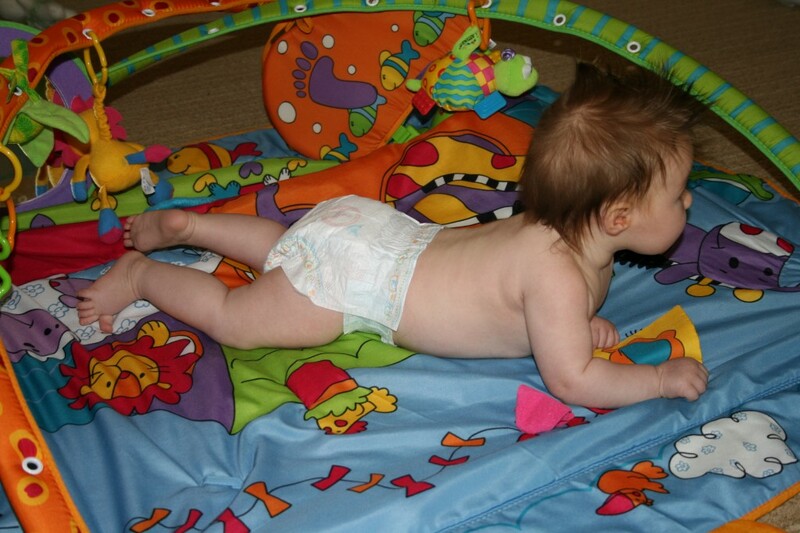 Research has repeatedly shown that a lack of tummy time contributes to gross motor delays such as lifting head up/head control, rolling over, pushing up and crawling. 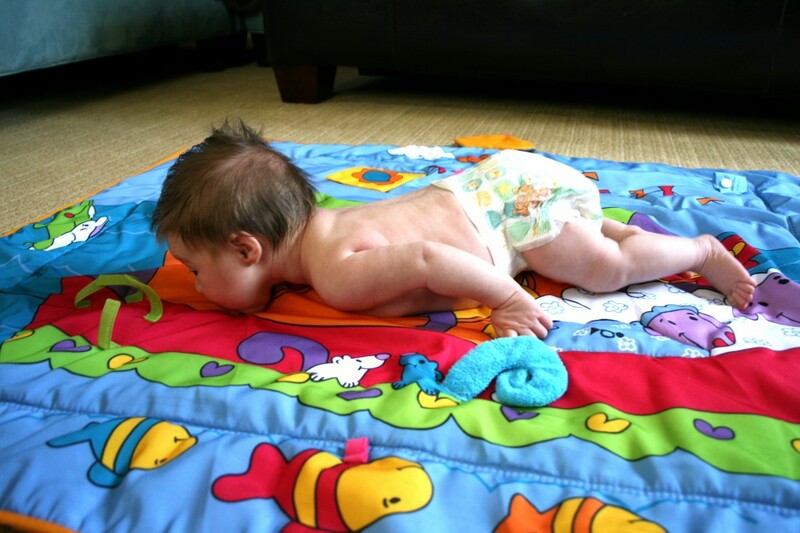 However, tummy time is imperative not only for gross motor development, but for the foundation skills required for fine motor, oral motor, body awareness, vision, and self-soothing skills. This series will address the importance of tummy time from birth to seven months, provide benchmarks for each stage and the developmental importance of tummy time for many domains and body systems. A parent’s anxiety about tummy time can negatively affect how their infant perceives and experiences this important position. SIDS is a scary thing, but parents feel they have a strong, effective tool to help combat the likelihood of it happening to their child: by placing their infant on their back to sleep. Unfortunately, even if a parent understands that it is during sleep time that the back position is important, it is difficult to turn off that anxiety about the tummy time position even during awake hours. In turn, when a baby fusses or cries while on his tummy, parents swoop in to rescue them versus calmly trying to modify the situation to truly figure out why the baby is upset. 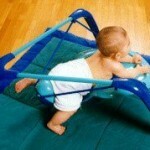 Babies have great instincts and they figure it out quickly that the tummy is a position that should cause anxiety. Thus, many babies do not tolerate it well. There is much parents can do to help babies develop happy routines on their tummies. The easiest way to start is at birth when a baby is used to being “smashed.” A full term baby’s house is very small before birth when she is most often supported in a “fetal position” by the uterine walls. After birth, the floor can also provide that kind of comfort barrier. Because it is more difficult for babies to remain in a flexed position on their back, often nurses and families choose to swaddle to contain them as if still in utero and to support them before their muscles really have had a chance to first stretch out and then learn to move efficiently and with control against gravity. The tummy down position after birth is comforting. If it is repeated frequently and consistently everyday, trying it first whenever you place your baby down, it remains a very comfortable position and a place where your baby can happily learn to move, play and grow. For a photo essay and general description of what to expect the tummy position to look like from newborn to seven months, see blog post, Madeline’s Tummy Time Journey: Birth to Seven Months. Future blog posts will also describe this journey in greater detail to explain why your baby’s posture and movement changes as she matures. Stay tuned! 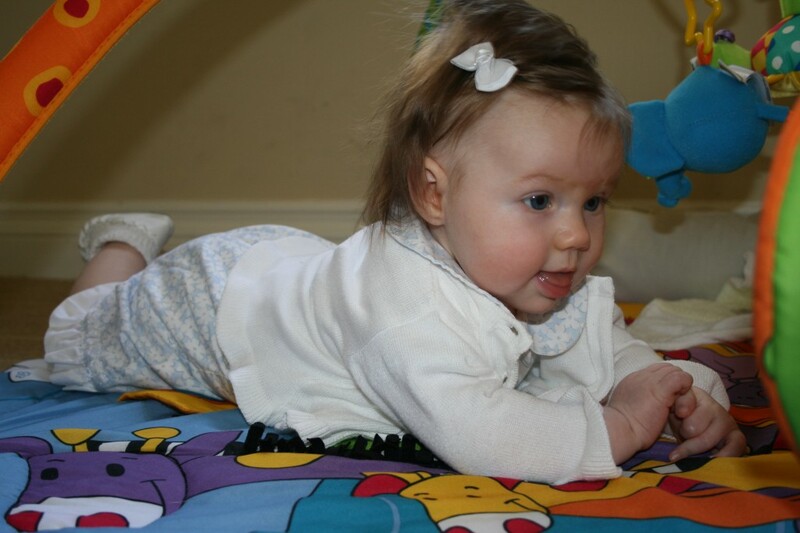 This series of photos and captions follows one baby girl, Madeline, from six days old to seven months in order to illustrate the typical progression and development of posture and movement skills while on the tummy. Disclaimer: Rather than choosing to use infant seats and other containers, Madeline was placed on her tummy first every time she was put down on the floor. 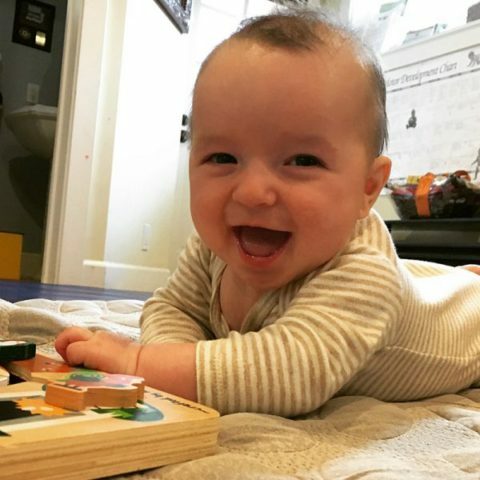 She practiced tummy time regularly and usually enjoyed more than 60 minutes per day from birth and more than 90 minutes per day after three months of age. At six days old, baby Madeline shows appropriate physiologic flexion and is supported by the floor happily in tummy time! The floor helps to prevent startles and providers her the opportunity to see her hand and get it to her mouth to start learning self-soothing skills. The floor serves as a soothing confinement, similar to the sensory experience of being in the womb. Though she occasional works to lift her head away from the surface, she is content to relax into the surface. At 27 days old, baby Madeline’s legs are more extended at her hips and knees, allowing her pelvis to drop and weight to shift backwards a bit. Her arms at the shoulder and elbow are also stretched out more, allowing them to come away from her body, though her elbows are still behind her shoulders. She can lift her head higher, but total clearance from the floor as she rotates side to side is not a regular occurrence. VISION is a key driver to help “right” the head so her eyes approach the horizon. This natural drive to reach the visual horizon is essential for development of head control. At six weeks, Madeline is more disorganized in her postures and movements than when she was birth to four weeks because she has had sufficient time for flexor muscles to relax and stretch out, but not enough time to develop active, controlled contractions against gravity. Head lifting while on tummy is typically unilateral so that her head is slightly rotated one way or the other rather than controlled in the middle. Babies can lift head to 45 degrees briefly, but there is still a lot of head bobbing. At eight weeks, Madeline’s pelvis continues to drop because hip flexors are stretched out more and head lifting is easier because of 1) increased mobility in cervical/neck and thoracic spine; 2) increased strength in extensor muscles against gravity; and 3) a strong desire to lift head because of vision and vestibular/inner ear righting reactions that work to maintain eyes on the horizon and nose on the vertical. Postures are still asymmetrical, elbows tend to be behind shoulders, and there is inconsistent weight bearing through the arms. At eleven weeks, Madeline demonstrates more extension in the spine and, finally, the ability to get the elbows in front of the shoulders for more effective weight bearing on the arms. Babies at this age to three months should hold their head steadily at 90 degrees, maintain midline position and rotate each direction. At 14 weeks, Madeline can easily hold her head up to 90 degrees with elbows in front of shoulders. She shows great symmetry between left and right sides on tummy and all other positions. By this age, babies should spend at least 90 minutes per day on their tummies. At four months, Madeline is starting to play with the swimming position where head and all limbs are extended off the floor. She will alternate between swimming and bearing weight, which is important to develop co-activation and symmetry between the front and back muscles. At six months, Madeline is performing a straight-arm plank, challenging herself to discover what her body can do! 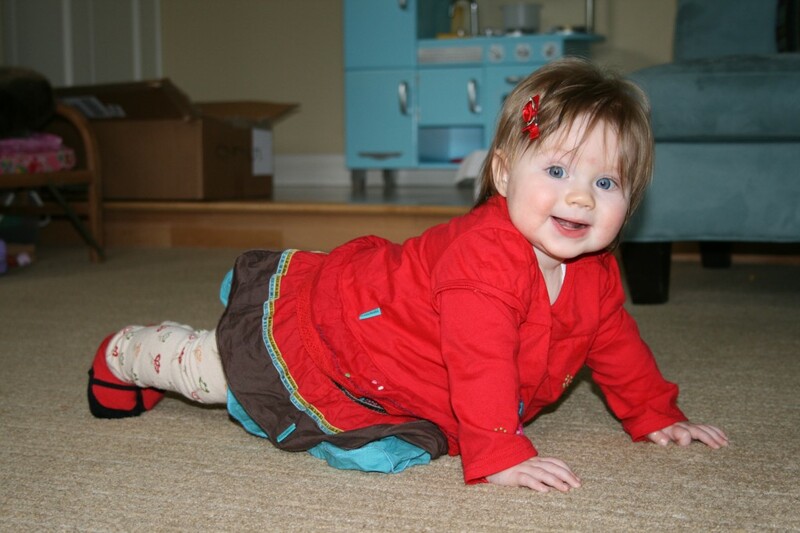 She moves easily around on her tummy, rolling, scooting, and pivoting independently. She sits independently when placed and is working on the transition from floor into sitting as well as the transition to hands and knees and rocking back and forth…getting ready to crawl! At this point, tummy time is usually a position for transition rather than the end product because she is independent balancing in upright positions. She has more access to her environment, people, and toys when sitting, where both her hands are free to explore and manipulate objects. At seven months, Madeline shows us ultimate control of her body while on her tummy. She has shifted her weight over her right side, balancing without falling while reaching her left hand across her body. Movement like this requires precise balance and control of muscles on the front, back, right and left, all working in coordination with one another. Her body is active from her head to her toe. At this time, Madeline is capable of getting onto hands and knees and transitioning from her tummy to sitting by herself. It has already been 4 weeks since Baby #2 arrived! We have gone from the newborn “shock” and calm from leaving the comfy, cozy womb to truly being more awake, alert, and aware. I have also had 4 weeks of working to practice what we preach in our Tummy to Play Everyday Classes. I am a second time mom and now work to manage (aka juggle) a 3 year old, a newborn, a household chores/errands, and, oh yes, trying to “sleep when baby sleeps”! I think that I now have a unique opportunity to blog about the reality of implementing much of what is presented in our classes . . . when life happens. So, here it goes . . .
Start Tummy Time Day 1: Check! Have done it every day. One of our favorites is tummy to tummy. It is so peaceful to watch a little one sleep but I sure would love some too! We have managed to do true tummy time on the floor one time each day. He is not always happy and begins to fuss after a while. BUT, I do change his position or modify something before picking him up (ie. Put him on his side, eye level smile, sing, pat his back, etc.). It definitely helps for a short time. Leave the Carseat in the Car: I have ventured in to the doctor and the grocery store using the Sleepy Wrap only. I find it much easier to go “car seat free” in public when with just the baby. It is much easier to chase after the older one because “his listening ears weren’t turned on” while pushing a stroller vs. having a newborn in a carrier. The car seat does stay in the car when we come home – a tremendous change from Baby #1. Container Culture: Hello, my name is Rachel and I use a container with my baby!! 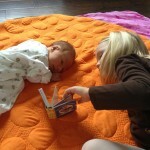 My first son really only wanted to be held or be in a carrier – which became quite exhausting! With Baby #2, we have more variety: held in arms or a carrier or being in the Co sleeper, pack and play, and the bouncy seat. This baby still has yet to enjoy the swing. The bouncy seat has been so useful for short periods of time for mommy to grab a shower, a peaceful meal, and also gives him a different view of the world! Making Movements Meaningful: Another tip that has been difficult to implement ALL the time: meaning all diaper changes, all transfers between caregivers, etc. Yet, I find myself doing it more automatically than 4 weeks ago and definitely more automatically than with Baby # 1. Symmetry: Wow! This has been the toughest one! I am a physical therapist that works with children, have had one baby already, and still find it difficult and awkward to switch to my right side when carrying, bottle feeding, etc. I didn’t realize just how difficult it would be. Bonding: I love this part!! My favorite times are our tummy to tummy play and snuggles, when baby is fast sleep in the carrier making cute baby sleepy noises; talking to baby about what he is doing, what I am doing, what we are doing together; making faces and imitating sounds; and kissing every sweet baby part on that lil monkey (cheeks, fingers, belly, toes . . you know). I will continue work daily to practice what I preach and love the knowledge that I have gained by doing these Tummy to Play Classes. Let’s continue on this journey together as our children move, play, and grow!